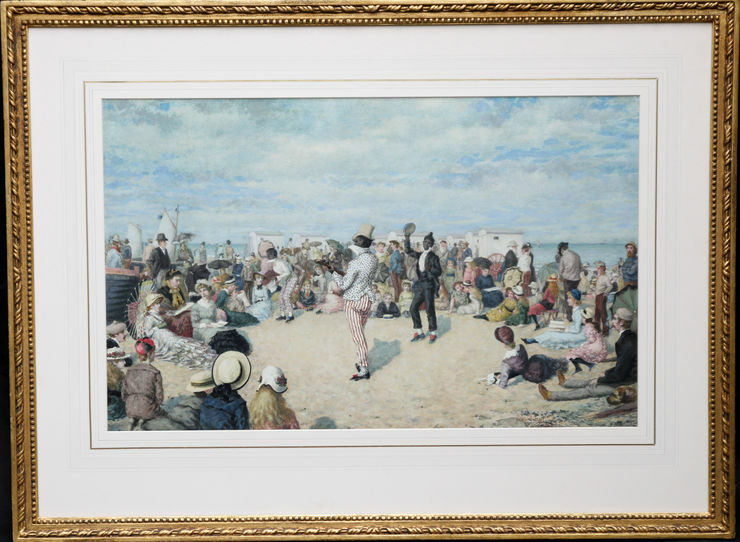 An original British Victorian watercolour by Owen Dalziel which is titled A Morning Concert and is dated 1883. A fine large painting. 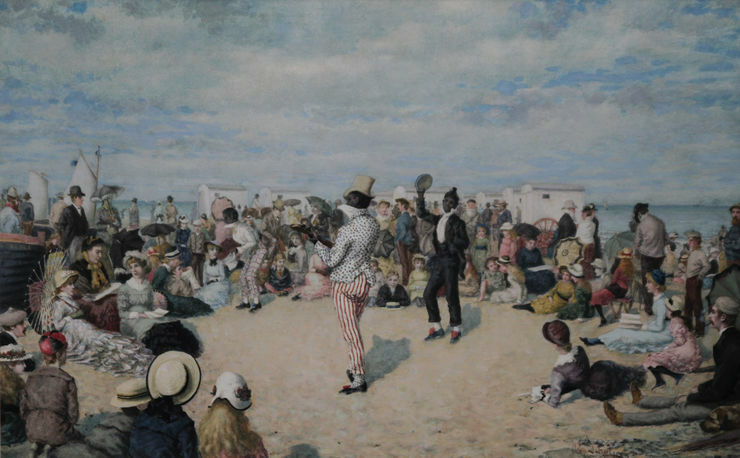 It is a super historical record of a Victorian beach scene with musicians entertaining on a beach. This painting is one of his best. This is a fine and very detailed example of a late 19th century British marine beach scene. It is populated with numerous figures against a blue sky and sea backdrop. It is also an early depiction of black entertainers in Victorian England. Signed right and titled verso. Gallery frame 35 inches by 25 inches. Owen Dalziel (1861-1942) exhibited between 1880-1908. He was a landscape, figure and marine painter exhibitng at New England Art 1888. He lived in Oppians Way Primrose Hill London (Ths address is in his own hand verso). He exhibited Birmingham 7, Dudley Art Gallery 1, Liverpool 2, Manchester 7, New England Art 2, Royal Academy 17, Royal Society of British Artists 23, Royal Institute 1, Royal Institute of Oil Painters 14.